East Side Gallery via Ben @ Flickr. Night had fallen when Lewis and I first arrived into Germany’s capital. Travelling from the quiet Lincolnshire town I call home, I was more than a little excited to spend a few days amongst civilisation. Riding the U bahn from the airport to the city I pointed out the warning signs stuck to every window in the train carriage, unsure what they were indicating. Lewis explained: “Um, I think it means you can drink on the train, but don’t throw your beer bottles out the window.” Berlin already seemed like a city on my wavelength. Not one to miss an opportunity for a drink despite the late hour (we were in a city, after all), I dragged my reluctant companion out onto the streets in search of a local brew. The district of Friedrichshain is a gem of east Berlin. Its edgy bars boast exactly the right amount of cool versus grit; you feel like a hipster just for stepping inside. I boldly asked the barman to serve me his “most German beer.” Unsurprisingly, he gave me a weird look and a huge bottle of pilsner. I don’t like pilsner, but thought ‘when in Berlin…’ and did my best to enjoy it like a good German would. During the daytime fashionable Friedrichshain is a hive of alternative culture. 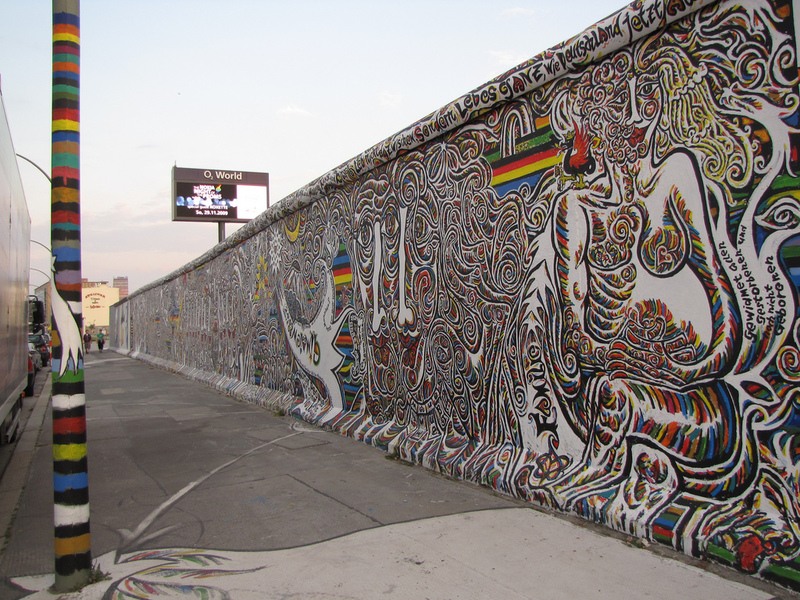 It’s home to the East Side Gallery, the longest remaining stretch of the Berlin Wall which is now an ever-evolving piece of street art. Breakfasting outside in the spring sunshine gave me an excellent opportunity to people-watch over my cheese platter. I’d never seen so many people with facial piercings and ‘modern’ haircuts outside of a music festival. At pedestrian crossings I almost expected the green man on the sign to have a Mohawk. Drinking beer in the street (not just on the train) is commonplace at all hours in east Berlin. Lewis, in his very English way, was slightly horrified by this custom. I bought a bottle from the corner shop and joined in. The following morning the sun continued to welcome in the new season, so we took the opportunity to hire bicycles and journey west. Berlin is an extremely bike-friendly city and cycle lanes are marked out on almost every road. We pedalled the course of the river Spree, through upmarket Mitte in central Berlin via peaceful, tree-filled, cobbled paths towards the western suburb of Charlottenburg. Our aim was Schloss Charlottenburg: the classically beautiful baroque palace that is the area’s biggest draw. The journey from east to west was an education in Berlin’s two sides. From the graffiti-covered walls of Friedrichshain we entered an attractive, quiet riverside district where even the homeless population had the relative comfort of bedside tables piled with books. Pleasant and posh as west Berlin seemed, I’d felt more at home among the tattooed, street-drinking locals of the east. It was a joy to cycle back to a grimy bar, crack open a bottle of German beer and release my inner hipster. It’s nice to see Berlin from the perspective of a visitor. I’m living in Berlin since 28 years now. Hope you enjoy your stay! Glad you enjoyed reading 🙂 Berlin was a fantastic city to experience. I hope to visit Germany many more times in the future.